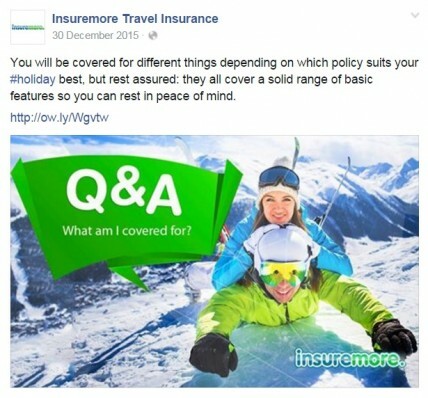 How we used our unique "Thematic Social Media" approach to help boost sales by putting a fresh face on InsureMore's travel insurance products and by repositioning them in a more fun and personable way. InsureMore has been providing top-quality travel insurance to millions of customers for nearly 25 years. With their wide and flexible range of policies, InsureMore offers comprehensive travel insurance coverage for families, businesspeople, weekenders, and globetrotters alike. No matter how outstanding your product, travel insurance – or indeed, any type of insurance – can be difficult to sell well. It doesn’t have the flashiness or excitement of, say, a brand-new car, and it’s not a tangible product you can hold in your hand. Furthermore, buying insurance necessarily involves serious consideration of things the consumer would prefer not to think about at all: what if something goes wrong? 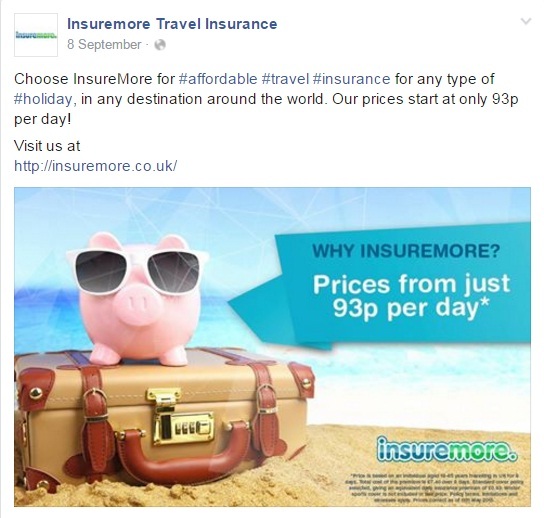 So when InsureMore approached us about creating a social media programme from the ground up, our challenge was this: how could we market travel insurance in a fun, fresh, personable way, without losing sight of what the product is about? Social media is an informal, relatable way to reach and interact with potential customers. More relaxed than straight-laced, perfectly polished web copy, social media content can help a brand seem more approachable and ‘real’. Despite that, however, we never lose sight of the very real business objectives social media helps to accomplish – brand promotion and increased sales. To create a successful social media programme, we would have to marry personable tone with focused business objectives. In order to achieve this, we began by drawing up a set of content themes with InsureMore, each of which would convey another important message. Each content theme was paired with a corresponding graphic concept, creating a clear and recognisable piece of content, week by week. 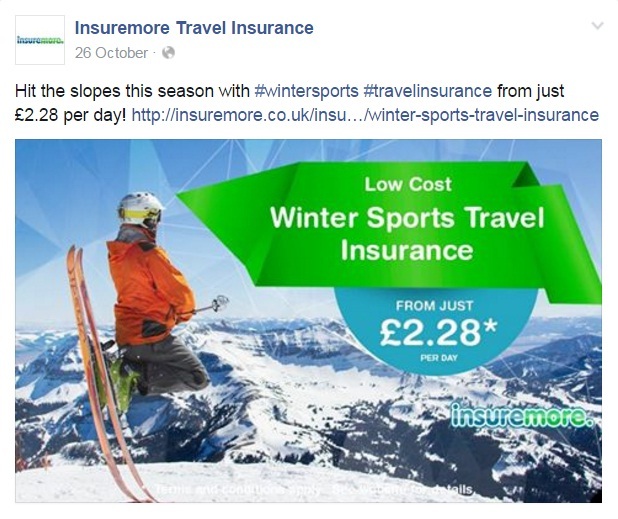 This content theme highlighted specific types of travel insurance offered by InsureMore – for example winter sports insurance, annual travel insurance, family travel insurance, or European travel insurance. By showcasing a selection of their products, we were able to communicate InsureMore’s wide-ranging expertise, as well as their affordable prices. One of InsureMore’s Featured Product posts. In order to sell travel insurance, there needs to be travellers! The destination highlight theme featured a different exciting potential holiday location each week. Designed to be engaging and inspiring rather than sales-oriented, this theme positioned InsureMore as experts in the travel industry. Each destination highlight post included enticing images of the locale in question, along with a nudge (in the form of an embedded link) to buy travel insurance before setting off. We later integrated this theme with existing social media hashtags on Facebook and Twitter. The #TravelTuesday hashtag is popular on both platforms, prompting many users to share travel photos and inspiration under that theme. By piggybacking on an already existing hashtag, we broadened the audience of our social media posts to include every user who was interested in the #TravelTuesday theme, and increased our chances of engaging with relevant potential customers. An example of a destination-focussed post. This content theme engaged followers with the tantalising possibility of winning a dream holiday. Similarly to the destination highlight theme, the Become a Winner theme engaged followers with inspiring travel destinations and getaways. 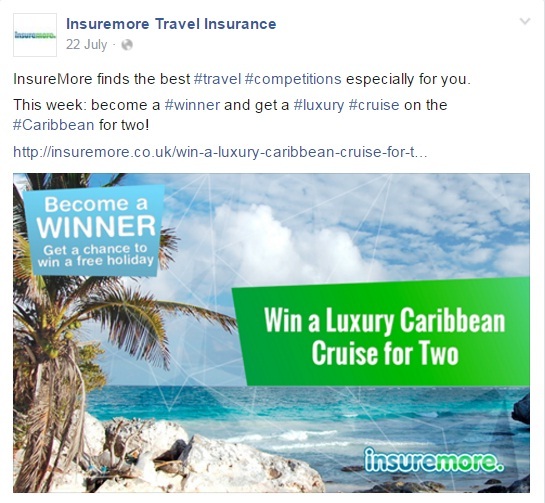 Every week we posted links to travel competitions we had researched and uploaded to InsureMore’s website. These might be anything from a family holiday to Disneyland Paris to a romantic getaway to Finland to view the Northern Lights. This theme was created to help address a tricky problem in the travel insurance business. How do you retain your brand’s presence in the mind of your customer until he or she is ready to actually travel? The Become a Winner theme provided an incentive for potential customers to keep in touch with InsureMore platforms. As we did with the destination highlight theme, we paired the Become a Winner theme with a relevant hashtag. The #WinnerWednesday hashtag trends weekly on Facebook and Twitter, so it was fairly simple to add this one snippet of text to our posts in order to increase our chances of reaching users interested in entering contests. An example from InsureMore’s ‘Become a Winner’ theme. This content theme centred around highlighting InsureMore’s USPs – unique selling points. 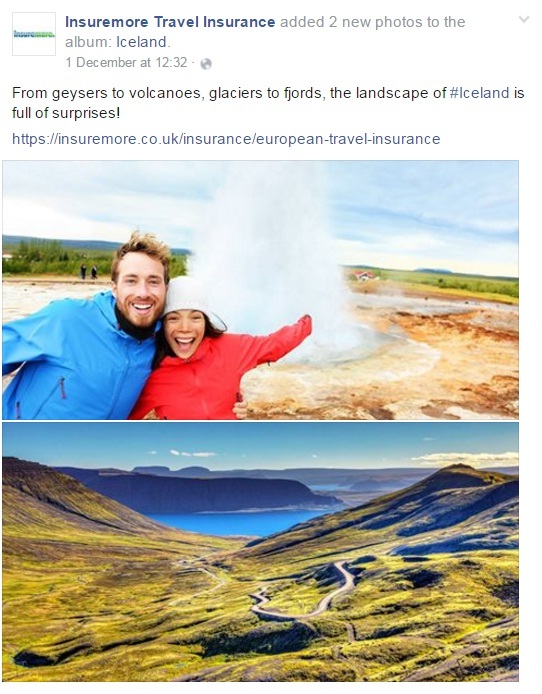 Each post in this theme emphasised a particular reason why customers should choose to buy travel insurance with InsureMore – and not the competition. Unlike the other content themes, the Why InsureMore theme explicitly focussed attention on the brand’s sales pitch. The ‘Why InsureMore’ theme aimed to highlight InsureMore’s edge over the competition. Some of the best sales content comes not from the brand itself, but from its satisfied customers. 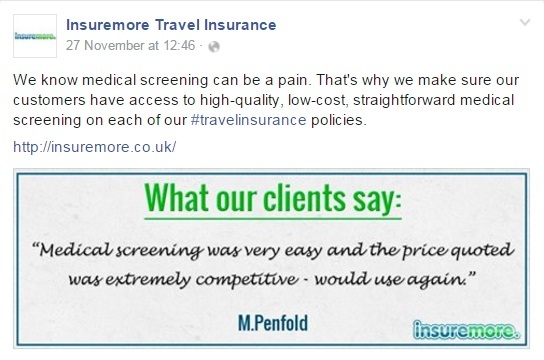 For the Testimonials theme, we capitalised on this by posting reviews from real people who had purchased travel insurance with InsureMore. Their positive words were an encouraging, unbiased assessment of InsureMore’s services, which helped to promote sales among undecided customers. The Testimonials theme highlighted a different positive statement every time. The #FollowFriday theme was a later addition to our repertoire of content themes. As we began a campaign to accumulate more followers on Twitter, we needed a way to engage them. #FollowFriday was already a popular hashtag on Twitter, trending each week as users suggested their favourite accounts to follow. Once we had established a follower base of relevant companies and individuals, we began highlighting our favourite accounts each week. When we tagged a user under the #FollowFriday theme, we were able to reach their followers as well – who could potentially be interested in following our account too! Furthermore we used InsureMore’s social platforms to answer their client’s most frequently asked questions about insurance. This way, we positioned InsureMore as a socially engaged brand whose team is there to help at any time of day. InsureMore’s Q&A theme functioned as a social help desk. The final theme aimed to highlight the special offers and discounts that our client offered, such as free car hire excess or free kids policies for family travel insurance. Post highlighting the Client’s offers and discounts. 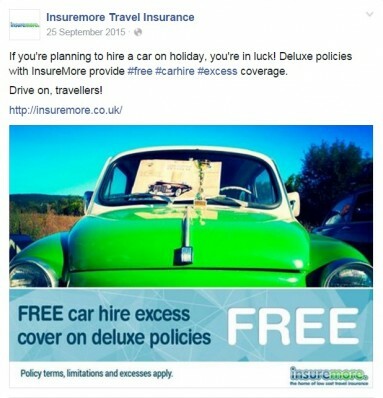 Our system of content themes helped to give InsureMore’s social media programme a workable balance between salesmanship and friendly, personable outreach. Overall, the programme we built for InsureMore promoted it as a modern, adaptable, socially engaged brand with a high-quality product that’s anything but ordinary! If you are looking for help creating an engaging and profitable Social Media Content Programme for your business and are looking for well-honed Social Media skills, solid commercial experience, superb graphic skills and copy writing excellence, get in touch for a chat.